Budapest's police chief has defended the use of force against protesters during clashes in Hungary's capital. Peter Gergenyi said police did not use excessive force against demonstrators on Monday and acted within the law. But opposition leaders accused the police of brutality during the events, which came on the 50th anniversary of the anti-Soviet revolt. Police used rubber bullets, tear gas and water cannon against stone-throwing anti-government protesters. "Instead of looking for mistakes, police can expect to be thanked by the honest citizens," Mr Gergenyi told the Associated Press news agency. He said police had found kitchen knives, iron bars, fireworks and catapults at the site of a five-week-old protest camp which police broke up early on Monday. He said material "necessary for home-made explosives" had also been discovered and that the camp had continued beyond its legal deadline. The capital remains tense a day after the clashes. Officials said 128 people were hurt in the conflict, which went on late into the night. Police arrested about 130 people. Hungarian radio said public transport was running as normal in the city centre on Tuesday. An area around the parliament, where protesters have rallied for more than a month, remained cordoned off, the AFP news agency reported. Prime Minister Ferenc Gyurcsany has defied calls to resign, describing the protesters as an "aggressive minority". The leader of the main opposition Fidesz party said the whole country was against his "illegitimate government". 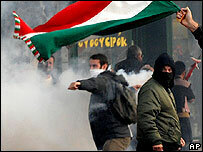 Opposition to Mr Gyurcsany turned violent last month after he admitted lying to win re-election. Many of the protesters were from far-right groups and some carried the red-and-white striped flag of the Arpad dynasty - a centuries-old symbol of Hungary that was also used by the nationalist pro-Nazi government during World War II. A group of demonstrators briefly commandeered a tank taken from an exhibition marking the 1956 anti-Soviet uprising. Eventually the police used a snow plough to break through the barricades and disperse the demonstrators. Mr Gyurcsany said the protesters were an "aggressive minority... terrorising us". "We have to defend the country," he said. The Fidesz party said the police had used excessive force to break up the protests. The party's leader, Viktor Orban, a former prime minister, told a gathering of his supporters that "an entire country has turned against this illegitimate government". 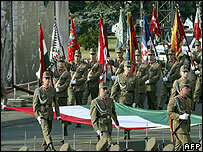 Earlier in the day, Hungarian officials and foreign dignitaries gathered at the parliament building to lay flowers. Some veterans of the 1956 uprising refused to shake hands with Mr Gyurcsany at the commemoration. The Fidesz party has long refused to mark the 1956 uprising with Mr Gyurcsany's Socialists, whom it accuses of inheriting the mantle of the pro-Soviet Communists. The Hungarian anti-Soviet uprising started in Budapest on 23 October 1956, with a spontaneous demonstration by a crowd of about 23,000, the reading of a pro-democracy manifesto and the singing of banned national songs. A giant statue of Stalin was pulled down, leaving only the dictator's boots on the pedestal. Soviet tanks were forced to withdraw, but returned with devastating force a week later.